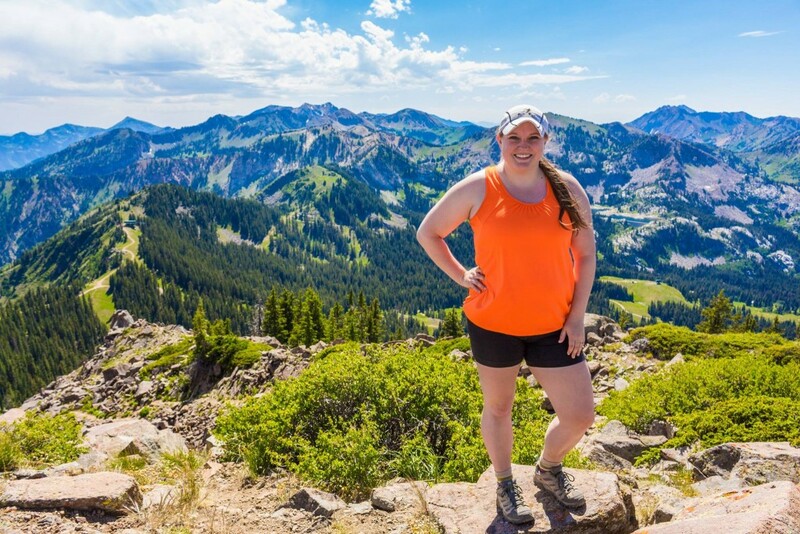 One of the best views in the Wasatch in my opinion is the view from Clayton Peak (also known as Mount Majestic) at 10,720 feet. 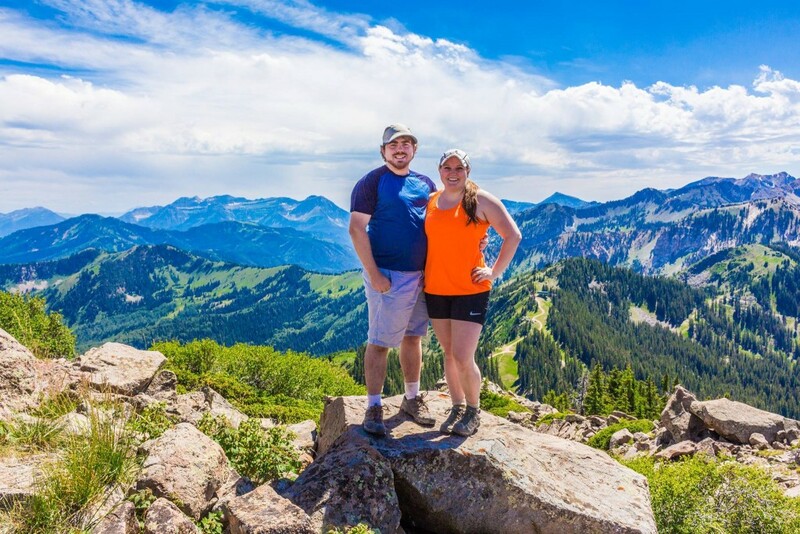 The view from the peak offers a panoramic view of the Brighton Lakes area, the Wasatch Mountains, the Uinta Mountains, Heber Valley, and Mount Timpanogos. It’s breath-taking, and an relatively quick peak to bag at 2.5 miles round trip (in comparison to others in the area)! Take I-215 S and exit on 6200 South towards Big/Little Cottonwood. Turn left after exiting the interstate. Continue East to the canyon on Utah 210, following signs for Brighton and Solitude. 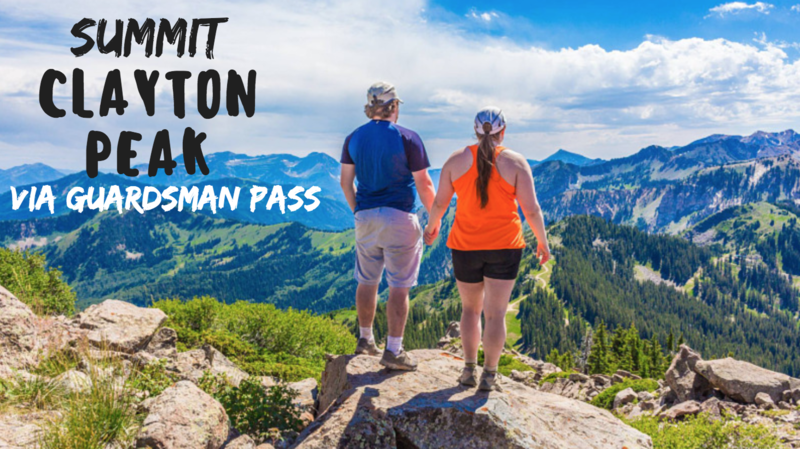 Drive all the way up Big Cottonwood Canyon, turn left onto Guardsman Pass Road (it’s narrow and winding), and park at the Guardsman Pass Overlook parking lot. You’ll see lots of cars and a dirt lot on the right. Trailhead Restrooms: Not at this trailhead, but there is a pit toilet about 1/2 mile down the road on the way there. Dogs*: Yes, technically. 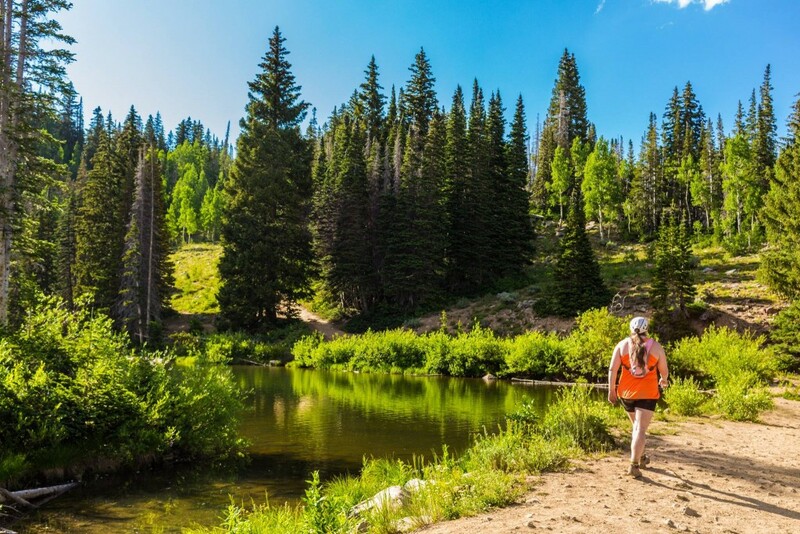 It’s on the ridge above Big Cottonwood (watershed), so there is no restriction on this trail, but be aware that Big Cottonwood Canyon does not allow dogs. 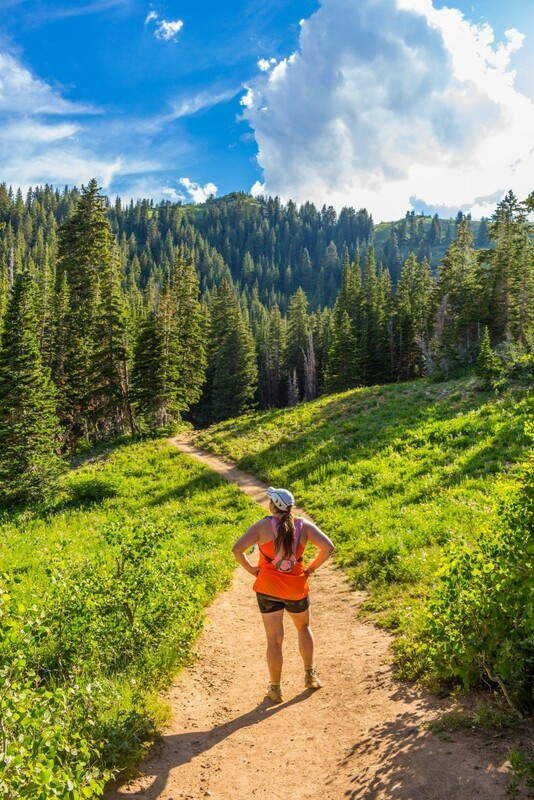 *Note: There is another trailhead that meets up with this trail starting behind Brighton Ski Resort. That trail is not dog friendly. The trail starts out climbing up the ridge of the mountain. The first time we did this hike, we considered turning around because we felt like it was going to climb the whole time. In this photo above, you can look back and see the parking lot where you parked for the trailhead. It doesn’t climb the whole time, but it is tough at first. You’ll approach Peak 10,420, which is a nice view, but you can also bypass it like we did on this trip by following the trail until a small split, then going right. The peak will be on your left-hand side, and there’s a chance you’ll even see people on the top. 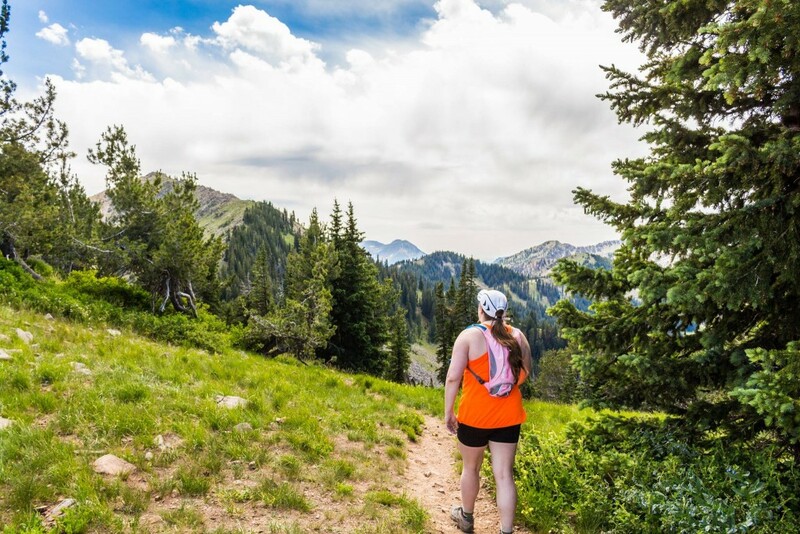 At this point the trail flattens out a bit as you are suddenly looking down into Big Cottonwood Canyon on your right, and Clayton Peak is directly in front of you. (In the photo above, I am approaching that overlook). Watch for the path as it winds around the base of Peak 10,420 and descends a little. (See above photo). You will approach a fork in the trail: one trail goes left, down towards Lake Lackawaxen, the other one straight ahead up the ridge to Clayton Peak. You’ll take the path that leads into the grouping of trees. The trail follows the ridge up to the peak at this point. You’re in the final stretch! 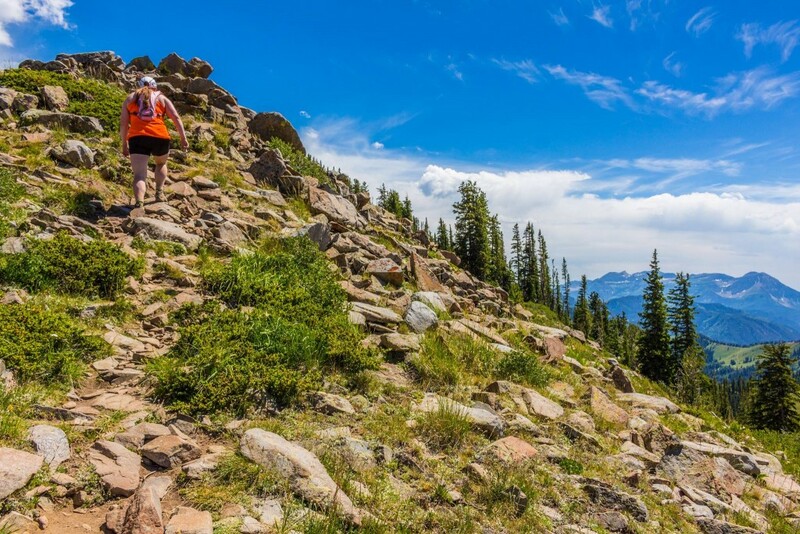 The trail is generally easy to follow until you reach the boulder-hopping portion. Even though you are exposed on the boulders, they aren’t covered in dirt (making it easier to grip the rocks as you climb up). I would recommend going with a friend and/or bringing trekking poles to help stabilize you. I’m a big baby when it comes to these types of things, so Brighton helped me by giving me a hand on tricky parts. The view from the top makes the climb worth it though! 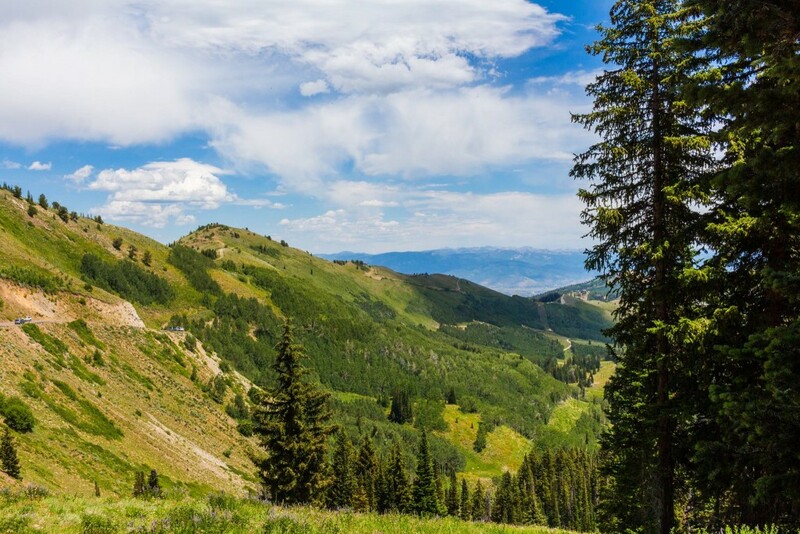 You’ll see Big Cottonwood Canyon, Timpanogos, Heber Valley, Park City, etc. It’s nice to just sit up there and enjoy the feeling of being on top of the world. 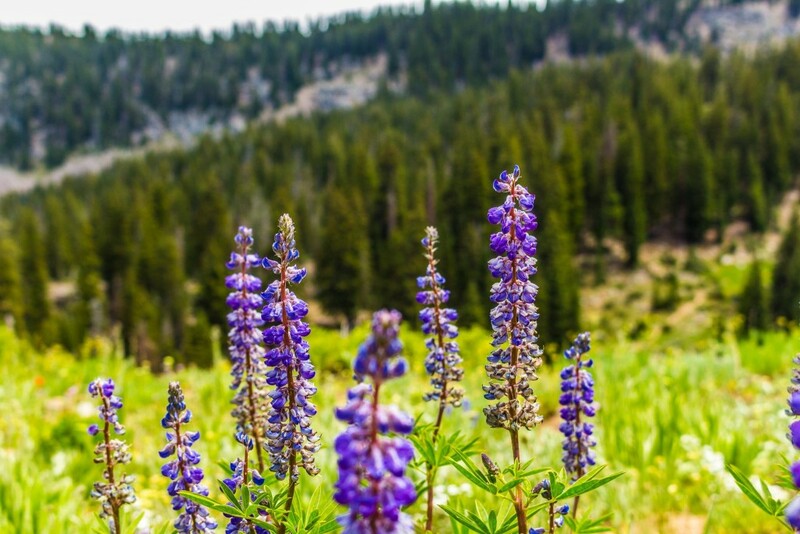 We went in mid-July, and we were treated to wildflowers the entire route. On our way down, we decided to loop around to see Bloods Lake on the way back. 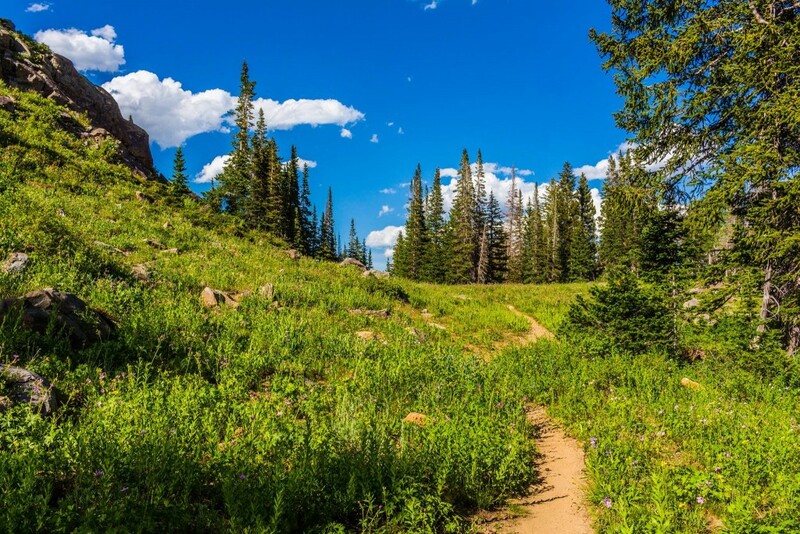 To make this loop, you can climb down the ridge, and at the fork before the last climb to the top, make your way down the field of wildflowers into the basin, and turn left when your trail meets the next trail. It will be obvious when you see it. This portion of the trail was nice because it was generally flat or gently descending. It opened up into a couple fields of wildflowers and grass, which was very pretty on this summer day. One little difficulty we had on the way back was we ended up in a wooded area near the lake, with a huge “NO TRESPASSING SIGN” on a tree. We couldn’t figure out what property was on private land, so we did our best to get back to the parking lot as quickly as possible, as that was not our intent. We did find Bloods Lake, where many people were hanging out with their furry friends. At that point, the trail back to the parking lot was clear. It was steep for a short section climbing back up to the lot, but it was manageable. After I got home, I read online that Bloods Lake, the one where everyone was hanging out, was actually private property. I didn’t realize that when we were up there. There is mixed information online about whether or not you can go to the lake, but the gist of what I read said that as long as people are courteous and clean up all dog waste and trash (and pack it out), the owner is okay with people enjoying the lake. With that being said, it’s up to your discretion and it’s at your own risk! 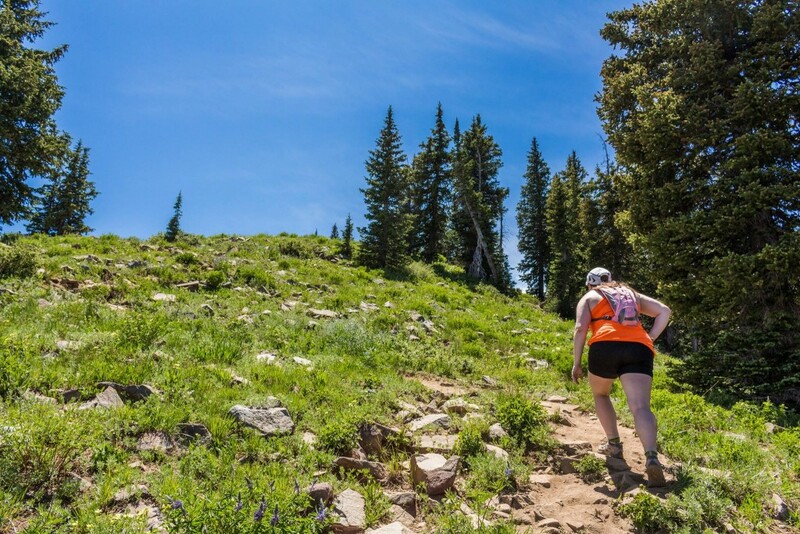 Bring trekking poles and/or a friend to help in the tricky sections. As I have mentioned in previous posts, I am not an experienced climber (but I’d love to be! ), and having Brighton there to help me navigate the boulders helped a lot. It’s also good to have a friend there in case of any emergencies. If you can’t find a friend, trekking poles will help stabilize you on some portions as well. Pace yourself. While this hike isn’t very long, it does gain a bit of elevation in a short distance. Take your time, enjoy the views, and be aware of the elevation. 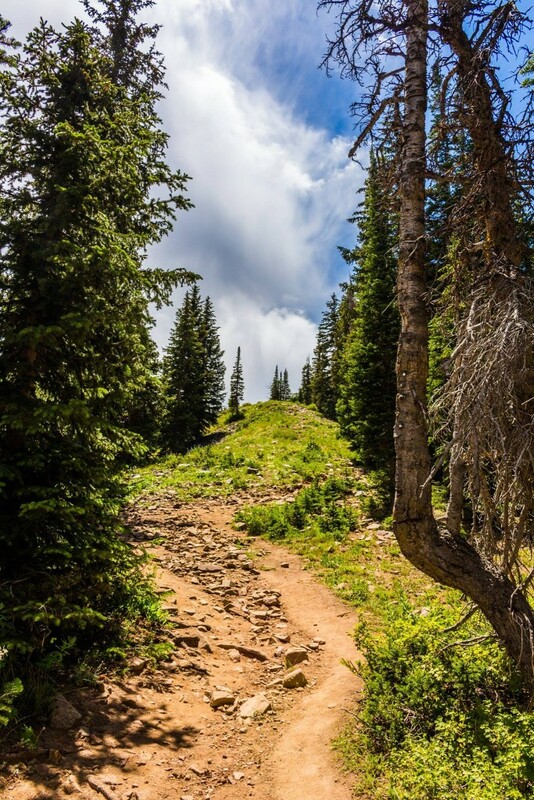 You’re about 10,000 ft above sea level, and if you’re not acclimated to this high elevation, you may experienced some symptoms of altitude sickness which includes dizziness, nausea, loss of breath, and headache. If you’re looking for a bonus peak, summit Peak 10,420 on the way to Clayton or the way back. 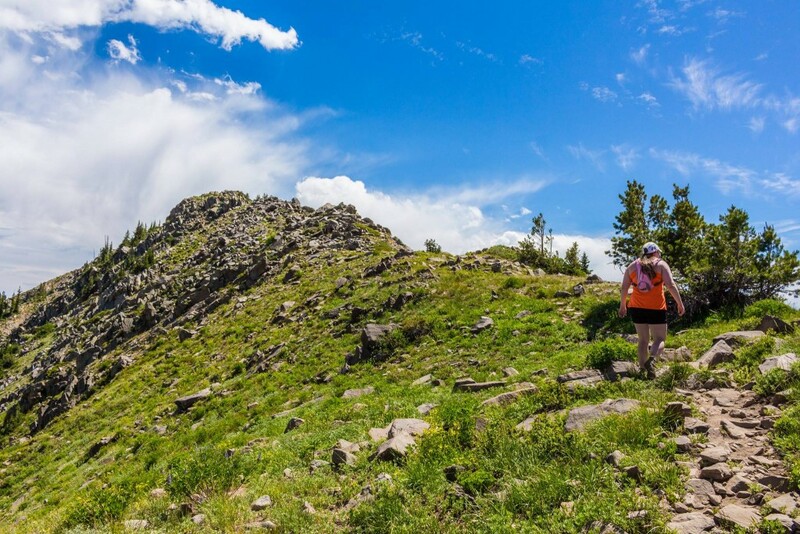 If you’re feeling too challenged by the hike, go around it using the trail to Clayton. 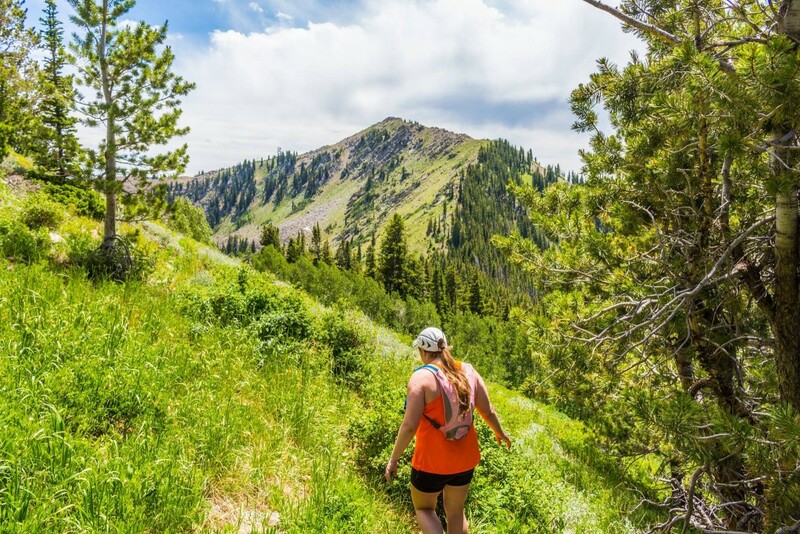 What are some of your favorite Wasatch peaks to bag? Thank you! It was a great hike. One of my favorite views in the area for sure!